Two hot summer days ago, UPS delivered bolts of our new Barbados fabrics. Wanting to make something right away, I thought of the cool comfort of dashikis I learned to love when I lived in Kenya years ago. 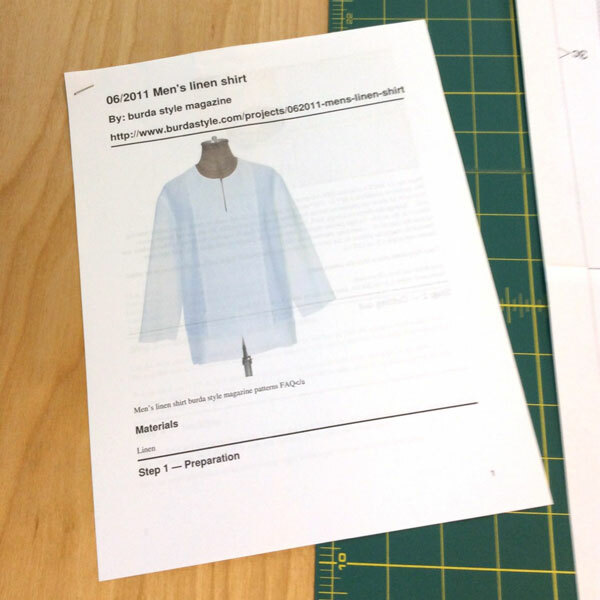 Weeks and I combed the internet for a good pattern and she found an affordable ($5.99) and downloadable pattern — Burda “Men’s Linen Shirt #138.” Though the pattern calls for a fabric that is the same on both sides (which is to say not a print), with a little adaptation I hoped I could make it work. 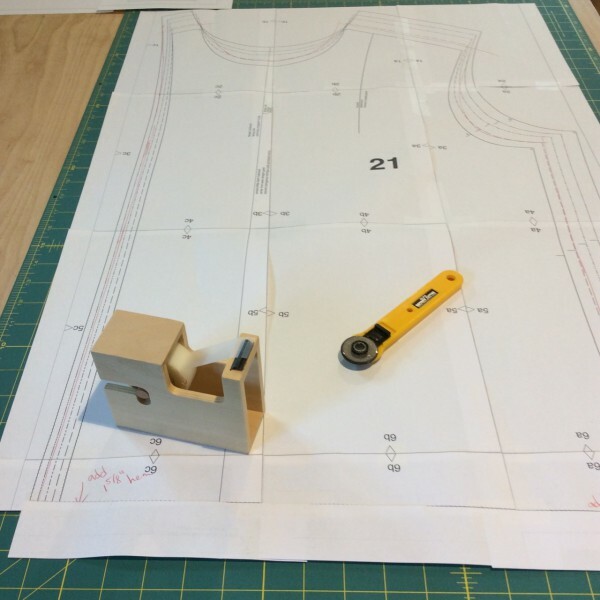 This was my first time using a downloadable Burda pattern. Though it has only four pattern pieces, it required 26 sheets of paper and a fair amount of tape. The material requirements called for 59″-wide linen. 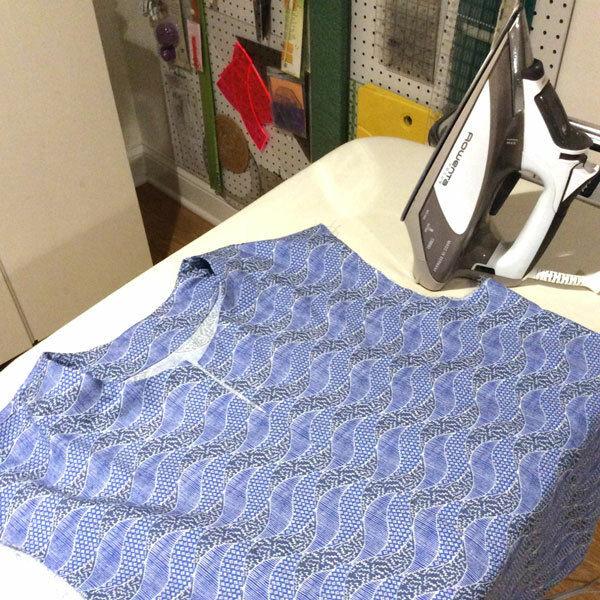 I calculated that I’d need 2 1/2 yards of 42″-wide fabric which I prewashed as I taped together the printouts. 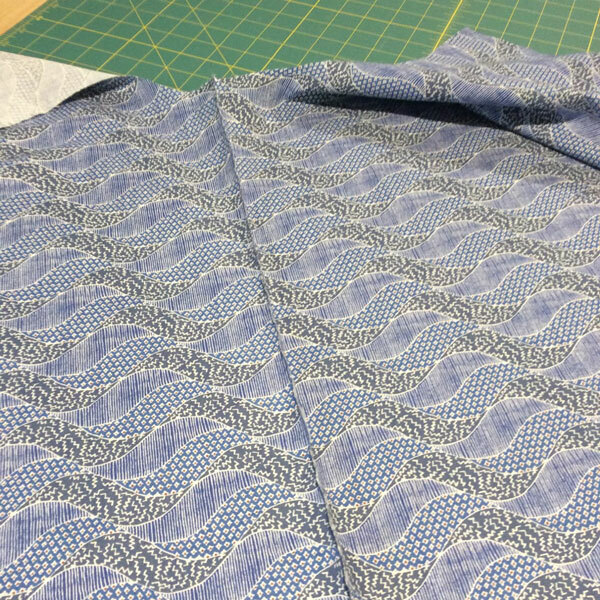 I’m a sucker for blue and thought the scale of our “Breeze” fabric would have the cool summery feel I wanted. 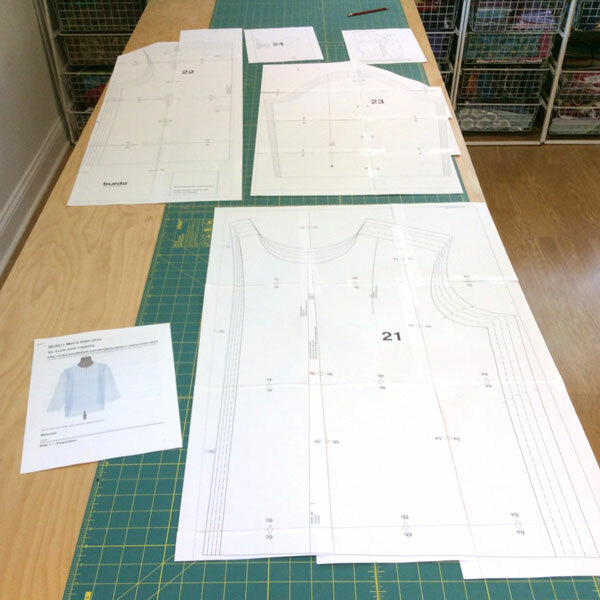 Unlike any patterns I’ve purchased in stores, this one did not include seam allowances. 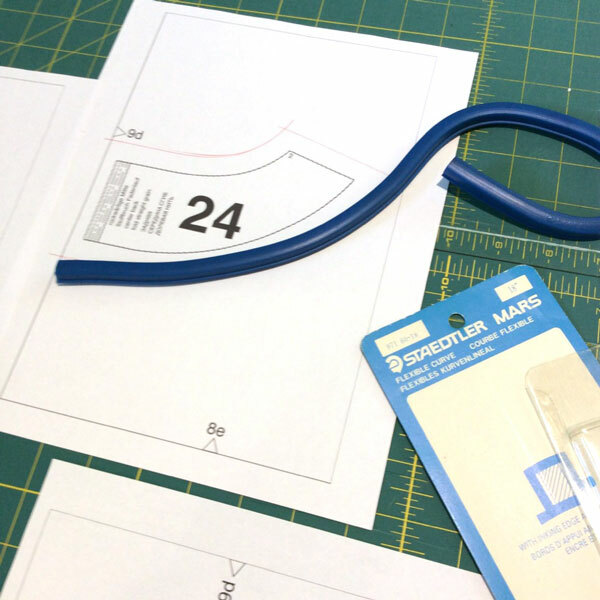 I used a flexible drafting curve to extend the pattern and create the seam allowances. I don’t know if this is common in downloadable patterns, but I found it a bit annoying (though easy enough to deal with). In fairness the pattern did say it didn’t include the seam allowances. The front comprises two sides which each fold inward to create a front facing. They are joined with a center seam. 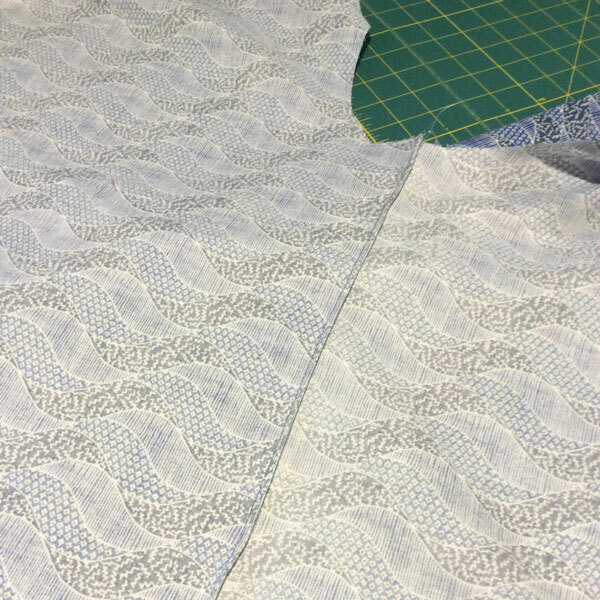 Given the graphic wave motif, it required careful planning and alignment of the pattern before cutting the fabric to ensure alignment of the repeats. The reason most dashikis have a center seam is that it allows you to have nicely finished neck and hem slits. It also lets you mirror large scale motifs if desired. Earlier I mentioned having to make a small adaptation since I was using a print and not a solid linen. The change had to do with how the back neck facing and inner front facings were attached at the shoulders. If you decide to make this pattern, it’s not hard to figure out, just know that it’s indeed possible. After wearing my dashiki all day in the summer heat and being so comfortable, I know I’ll soon make another. So what would I do differently next time? Add an inch to the sleeve length! I’ll probably wear the shirt with the sleeves rolled up most of the time, but when I unroll them they’re just a tad short. Overall I’m happy with the pattern. The dashiki has room for movement without being boxy. The biggest question is which fabric do I use next? 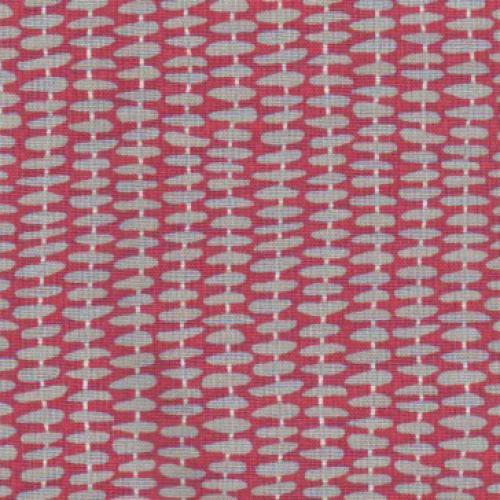 I’m leaning toward the red and gray Lanai print but am fond of the tan and taupe Resort print as well.